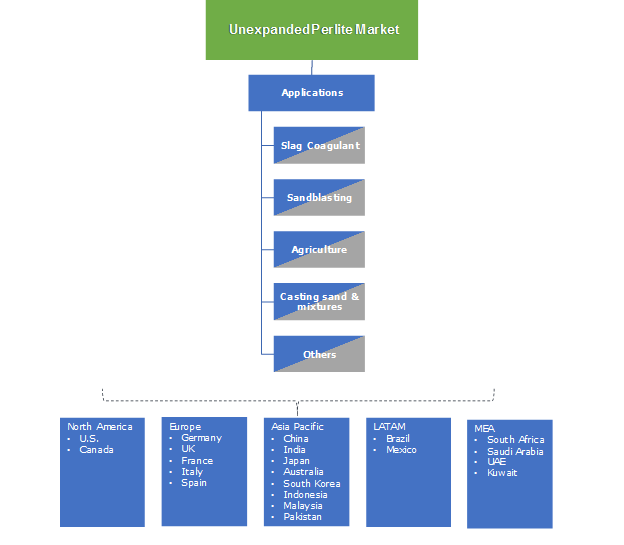 Unexpanded Perlite Market size was over USD 8 million in 2016 and is projected to expand at over 3% CAGR over the forecast timeframe. Positive growth indicators in the construction industry mainly in the Asia Pacific is attributed to industrialization & urbanization which will propel product demand owing to its sandblasting application in the industry. The aforementioned trend is likely to help generate promising gains to the unexpanded perlite market size over the projected timespan. In India, government has planned 100 smart cities which will invite investment of more than 2 trillion in the coming years which will help attain significant gains to crude perlite market size during the forecast timespan. The product possesses high heat resistance and insulating product properties which helps in removing impurities during sandblasting process. Sandblasting is a surface treatment process in which a solid surface is cleansed, shaped and smoothened using solid particles at high speed. The product is applicable for reducing the intensity of heat emanated from the sandblasting process. Additionally, there is no toxic gases emission or hazardous fumes by product use in sandblasting operation. Product also finds extensive applications across agriculture sector, as it is among one of the most important component for soil. It is used as an ingredient of fertilizers for soil as it provides aeration and balanced moisture for desired plant growth. The product makes soil ventilated and improves drainage with 60% ventilation and 90% porosity. It has a neutral pH value and is lightweight, weed-free and sterile. This makes it a desirable choice for growing plants in containers. In addition, owing to its low electrical conductivity, it protects plant from daily temperature fluctuations. Furthermore, it has several other applications across agriculture sector including carrier for pesticides, herbicides, fertilizers & pelletizing seeds, greenhouse cultivation, landscaping applications and small nurseries at home. The aforementioned trends are anticipated to make prominent contribution to crude perlite market size in the forecast timespan. Product has a complicated and high-priced extraction processes which makes it cost inefficient in comparison to its existing counterparts in the industry. Additionally, raw perlite contains fine particles which may cause breathing problems in humans, and henceforth are likely to obstruct the unexpanded perlite market size in the coming years. However, increasing R&D initiatives by major perlite miners to produce products with more value-added features are likely to generate plentiful opportunities for the crude perlite market size in the forecast spell. Crude perlite market size for sandblasting accounted for more than 40% of the total industry share in 2016. It is majorly applicable in sandblasting industry, owing to its low density and uneven rough shape which makes it an important component in sandblasting machines and helps in providing efficient surface levelling, abrasion & polishing effect for various industrial equipment. The product exhibits brilliant abrasive properties with high heat resistivity and low density which makes it desirable for several industrial applications like sandblasting, sand casting, filtration, industrial polishing etc. Rapidly growing construction industry in Asia Pacific, which is attributed to industrialization and urbanization in the region will subsequently drive product demand and therefore, will have positive impact on the unexpanded perlite market size in the near future. 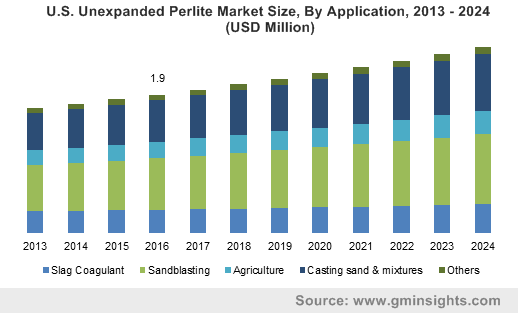 Crude perlite market size for casting sand and mixtures is projected to witness gains of more than 3.5% in the coming years. Product is mixed with sand casting mixtures as cushioning agent to recompense for the expanded crystalline silica when it goes through phase change with more than 1000°F heat. It also reduces its cleaning room costs by minimizing the casting defects for instance, veining, buckles, penetration and fissuring. Moreover, it improves the penetrability of the sands that decreases its venting defects. Thus, growth in metal & steel industries along with substantial product applications in foundries will drive product demand, which will make notable contribution to unexpanded perlite market size in the coming years. Asia Pacific unexpanded perlite market size is likely to witness gains of more than 4% over the forecast timespan. The regional growth is mainly driven by the extensive product application in sandblasting, casting sand mixtures and foundries. Rising foundry applications including sand casting and slag coagulant in the region is mainly attributed to the increasing construction and industrial operations which is likely to trigger mining activities to attain more perlite for its application across aforementioned industries. For instance, China discovered over 15 mines in their country in 2008, which doubled the perlite production and expansion and is likely to help boost the crude perlite use across various applications including slag coagulant, sandblasting, casting sand & mixtures, etc. which will subsequently have positive impact on the crude perlite market size in the coming years. Crude perlite market share is fairly consolidated owing to the presence of few large-scale manufacturers. Prominent industry share contributors are Imerys SA, Cornerstone Industrial Minerals Corporation, Perlite-Hellas, Gulf Perlite LLC, The Schundler Company, Hess Perlite, Dicalite Management Group, Pratley Perlite Mining, PVP and Midwest Perlite, Inc.
Key unexpanded perlite market players are making substantial investment in their R&D facilities to expand their product portfolio and attain competitive edge over its competitors globally. For instance, Imerys SA launched a new expanded perlite-based scrub product named ImerCare in September 2016 for the cosmetics industry. Unexpanded perlite, commonly known as crude perlite has wide-ranging applications including sandblasting, casting of sand & mixtures, agriculture and slag coagulation. Perlite is formed when molten rocks ejects out of a volcano and cools rapidly. Due to the rapid cooling, water is stuck within the rock and the lava turns into a glass-like rock. Product possesses excellent properties such as ease of potting, impossible to overwater, reduces Sulphur content in the iron/steel melt and also prevents reentry, non-polluting, efficient insulator and can coagulate the impurities, which makes it desirable for the aforementioned applications. Rising construction activities mainly in Asia Pacific has propelled demand for sandblasting machines and sand casters which in turn will make significant contribution to crude perlite market size during the forecast period. Furthermore, growing agricultural activities in Europe has triggered demand for agricultural grade perlite owing to its excellent hydration and aeration properties. These trends will have positive impact on the crude perlite market size over the projected timeframe.